Walking down our city’s (Mississauga, Canada) streets, one can see many Yoga studios that have sprung up in all the malls. Anyone would be fascinated by some of the names the studios had – Moksha Yoga, Power Yoga. Parivartan Yoga. Bikram Yoga (named after Bikram Choudhury, the India-born, Beverly Hills-based Yogi), Infinite Yoga, Hot Yoga, Organic Yoga, etc. It seems the city has now got into a “Yoga” craze. Most gyms in the city offer Yoga classes as part of their fitness regimes. Our children regularly attend them and are most amused by the Yoga instructors speaking out Sanskrit Yoga terms with their accents. Most Yogis who teach are non-Indians and the students also cuts across the class divide, obviously with hardly any Indians, as is seen in any outdoor, voluntary, adventure or physical activity in the city. Are you familiar with this sign? Seen it anywhere? This is the new sign for a “Yoga Room”, mostly at airports, hotels, gymnasiums across Canada and US. 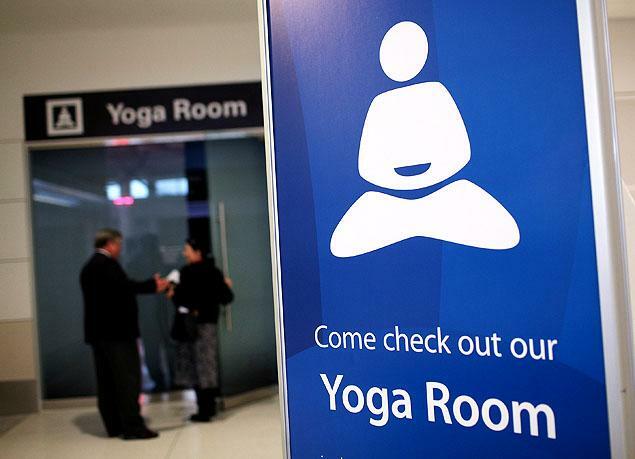 Think of any busy international airport and you probably think of ‘delays,’ ‘long lines,’ ‘hectic’ and ‘noisy.’ San Francisco International Airport, however, hopes that those will be replaced by ‘om‘ and ‘chill’ because of its new addition: A yoga room, in January 2012. The facility is open 24-hours a day and is free of charge. Dallas Fort Worth International Airport opened their Yoga Room in 2012 with Chicago International airport following suit and opened a Yoga Room in 2013. On a recent trip to India, our connecting flight was delayed by two hours at the Brussels Airport due to inclement weather. As usual the airport lounges were overflowing with stranded passengers. All possible seating was fully occupied. There were passengers all over the floor, young and old, some reading, some listening to music, some surfing the Internet on their Laptops and some chatting. My attention immediately caught a few children in their early teens from Canada, sitting on the floor with their legs crossed (Chaukadi/ Chamram – Lotus Position) and talking. I thought with the limited space available, I should take up that position and continue to read the novel I had, to kill the next two hours. My attempt to sit like the children failed miserably in half a minute. I just couldn’t sit like those children. My legs and back were paining and I thought all my muscles had cramped in unison. Then I moved my position next to the wall and with the support of the wall and with my legs stretched out, I could sit and read for five minutes and then I felt I did not have any control over my legs. My attempt to stand took a miserable half minute. This led me to ponder as to why I had such a problem sitting in Chaukadi position. I travelled through the time graph back to my childhood. I remembered that I could sit like that in the kitchen floor with our father and siblings and we used to eat the meals our mother served. As the economic situation of the family improved over the years, we added a dining room and with it came a dining table and the habit of eating our meals sitting on the floor in lotus position went out of the window. The only place where I sat on the floor was during the few minutes of sitting interludes we had during the Kurbana (Holy Mass) at the Syrian Christian Church. Most of the Mass was offered in our church standing (unlike the catholic churches) and we never had any seating arrangements other than for the old and infirm. The only other time we sat in the church was during the sermon by the priest – I always thought why it had to be that long and mostly repetitive. In the school we always had a bench and a desk and our father used to tell us as to how privileged we were and that during his school days they always had to sit on the floor, even in high school. Was it a privilege? I started to ponder? On return to Canada, I had to visit our son Nikhil’s Primary school to meet the teacher. As I walked through the aisle, I observed that in all the classrooms, the children and the teachers were sitting on the carpeted floor. Only half the class room was filled desks and chairs. 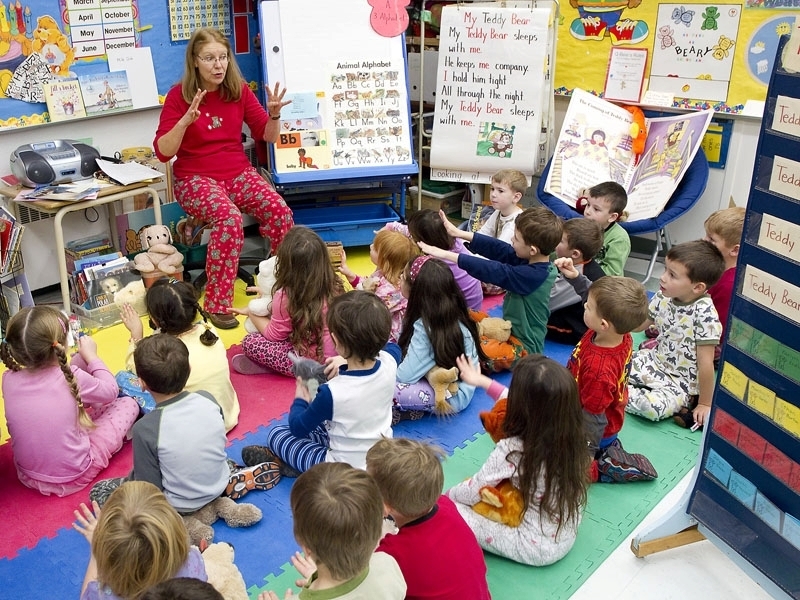 On enquiring from Nikhil, he said that most of the class time they spend on the carpet. The children always removed their shoes and placed them in the cupboard outside before entering their classes. In case someone wanted to wear shoes in the class, the student had to get an ‘indoor’ shoes and had to be keep it inside the class-room. Now I found the answer to my question at the Brussels Airport – as to how the Canadian teens could manage to sit in lotus position for such a long time. In the school cafeteria, fast-food is banned and Coke & Pepsi are strict ‘No Go.’ Students are mostly casually dressed and there are no ties and coats/blazers, in most schools there is no uniform. There is a lot of stress to educate children about the ill-effects of these junk food and pop and the results are showing in the fall of business for these stores. In India one sees long queues in front of the franchises of American Fast Food Chains. Later I called up a friend of mine, who is a principal at a private school in Kerala and tried to explain to him the importance of making the children sit on the floor – at least in primary classes. I reasoned with him our old traditions of ‘Ashan Kalari’ and ‘Gurukulam’ and as to how children learned to write and read sitting on the floor. The principal said that he could see the advantages of it, but to convince the parents about it would be next to impossible. In case he implemented my idea, he is sure that his school will face closure as no parent would like to send their children to a school where the students sat on the floor in lotus position. May be Indians’ loss is Canadians’ gain and Indians are picking up all that the Western World is now rejecting. Westernisation of our culture/ lifestyle has been taking place for quite some time and the current pace has been super-fast; whereas the Western world has already tasted the materialistic times and having realised its vices it is in corrective mode. Good article to awaken us towards retaining our past heritage. I am lucky to be able to sit in lotus position and meditate for up to one hour. Very very informative and interesting read! It reminds me of our village primarily school where we used to sit on ground on the mattresses. This is even now in vogue in most of the Govt run primary schools. Very well narrated as usual Col Reji!! Yoga and sitting in lotus position is very good for health. I have personal experience of it. My daughter tells me that Yoga is very popular in the US, and the flexibility of those practicing is much more than in India, the land of origin. You can always be in sitting position(sahajasaan/padmasaan), when meditating, watching TV at home, eating in temple or at times at home. (say one day in week), playing cards, or even boozing at home with close friends. When in sitting position, you are closer to your elements and chakras(energy points) of the body remain balanced. Reji, practice for 30 mins each day and you will get it over. One more point, if you can do 10 Surya namaskaars each morning, you will not have such problem .Surprisingly, many pseudo secularists oppose it in the name of Hinduism rather than viewing it Indian in essence. Please give the credit to India for spread of yoga in Canada/USA. Remember, the proponent of World Yoga Day( I participated in Raj path, Delhi last year) is INDIA. Let’s be proud of our great country ! Well written Reji & Abhay. It will come back some other time renamed because it may fetch an ISO certificate to a school. european closets are being used widely now. Recently I heard a talk by a doctor, proctologist, that the squat position is the best for passing motion and good for our health. It helps to prevent piles and other associated illness to a great extend. So, going back to the old ways brings back health. And this is being realised by many. Hope your article adds to this realization. Yoga is not a fitness regime as it is being made out in recent times particularly in the west but is a ladder to something far more important. Hatha Yoga which is the physical aspect of the yoga is being misunderstood as full yoga. Yoga encompasses the entire gamut of technology from hatha yoga , pranayama , kriyas , dhanya etc. Yoga is a set of techniques designed to bring about the ultimate well being and to discover the nature of your being. Fit and lean physical body are mere side effects of yoga. The most important aspect of yoga is the initiation by a spiritual master or to put in Sanskrit getting diksha from a guru. I don’t refer to the yoga teachers who teach various asanas or surya namaskar as guru or as what they teach as diksha. A guru is a living master and initiation or diksha is not giving a bundle of instruction but a subtler but extremely potent process whereby the master touches the subtler aspects of an spiritual adept and plants the seeds of liberation in sishya.. Regarding the sitting posture our human system is designed that the more you use the better it gets. I visited Isha Home school near Coimbatore recently. This is a residential school inside the Isha Yoga Center and is meant for affluent peoples’ wards, I found that all the students including the Class XII students sitting on the floor ( The first thing you do when you enter this school is to remove the footwear) The students are provided old munim style desks to keep their books and notebooks. So while majority of the schools don’t make children squat on the floor, there are still a few schools left to carry on this legacy. Well brought out Reji. I would like to add that in all hindu temples, sikh gurudwaras, and some other religious places as well, mostly the devotees sit on the floor in the Cross Legged Position. Now a days of course, some stools have been placed for the persons who cannot sit on the floor due to old age or infirm health etc. One of the aims of sitting on the floor could also be to sit at a level lower than the sacred book or the idol or even the pandit or preacher. Keep the good work up. At a recent lunch we sat on the floor and Mohana was mentioning this write up !! I We did Manage with a little difficulty albeit ! Good one as usual Reji ! Thank you Reji for reminding. Sitting on the floor has many health benefits which many doctors do not know or would not like us to know.